Ram Schachter law firm is the leading firm for solving legal problems faced by Foreign Residents in Israel. We are proud of the committed Communities of foreign residents living in the country and we appreciate and love the tens of thousands of devoted workers and caregivers who take care of the elderly and the disabled in Israel. Ram Schachter law firm provides extensive services to the foreign residents in Israel. We specialize in obtaining quick and effective solutions regarding immigration to Israel, including: dealing with the Ministry of Interior and the committee for humanitarian affairs, obtaining permanent worker visas, citizenship, marriage, relationships, inheritance rights, religious conversion, recognition of Judaism, and worker’s rights and compensation. At Ram Schachter law firm, we specialize in family status issues that concern the foreign residents. We formulate relationship agreements that maintain the spouse’s rights and that address recognition of paternity, shared life and family unification, children’s status, property agreements, wills and estates, in order to keep and maintain your personal and financial rights today and in the future. We are aware of the difficulties that foreign workers in Israel sometimes face, and especially those that dedicated caregivers may have with their employers. As such we will also be happy to help you with problems related to conditions of employment, payment of salary and severance payments. Ram Schachter law firm will be pleased to assist you in the preparation and filing of documents for legal status, and to accompany you to the Ministry of Interior during a hearing or any other legal procedure. 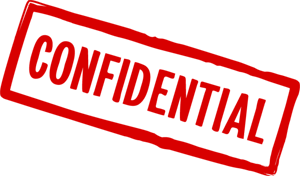 We recommend that you avoid engaging in legal processes without the professional assistance of a lawyer. Our firm provides full legal representation in general legal systems (magistrates’ court, district court, Supreme Court) and in special courts such as the family court, the administrative court, the court of appeals of the Ministry of Interior and the labor court. Ram Schachter law firm is proud to help protect the rights of the foreign residents by assisting with their legal affairs. 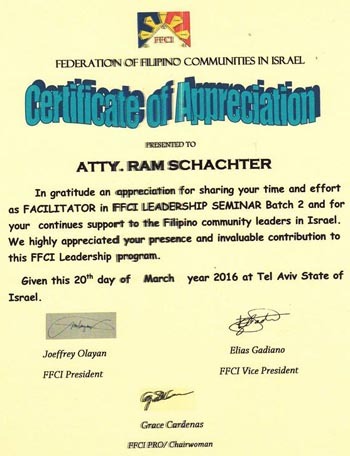 Ram Schachter law firm holds lectures and seminars about the rights of the Filipino community in Israel, in cooperation with the Philippine Embassy and the various organizations. We manage a Facebook group, Philippines in Israel – legal advising, with over 2,400 participants, which discusses legal advice for the community. Attorney Ram Schachter was born in Israel, and graduated in law from Tel Aviv University. 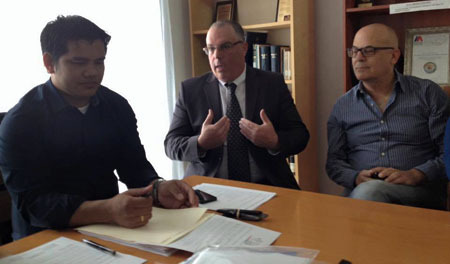 He has been a member of the Israeli Bar Association since 1994 and has a notary license that allows him to sign wills, relationship agreements and shipping documents, as well to carry out apostille authentication. He serves voluntarily in the army reserves with the military advocacy unit, and won an appreciation and excellence certificate from the Military Advocate General on Independence Day on 2000. Mr. Schachter is the chairman of the Committee for Immigration Issues and the Status of Residents in the Israeli Bar Association. 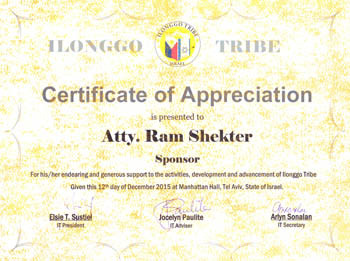 He has been granted a special certificate of recognition from the Israeli Bar Association. 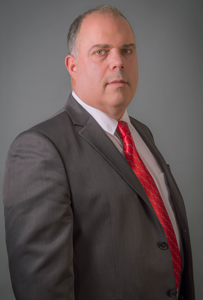 Mr. Schachter specializes in immigration issues, and represents clients at the Ministry of Interior. He assists clients from around Israel, including Tiberias and Katzrin in the north, the Gush Dan area (Tel Aviv, Jaffa, Holon, Bat Yam, Rishon LeZion), the coastal plain (Rehovot, Nes Ziona, Ashdod, Ashkelon), Jerusalem and the surrounding area, and Eilat in the south. 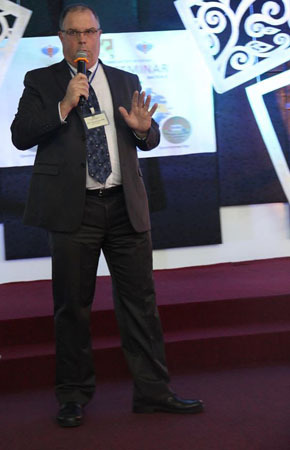 Mr. Schachter previously directed legal aid centers for immigrants in southern Israel (Beer Sheva, Ashdod, Ashkelon) in collaboration with aid centers in Tel Aviv, Jerusalem and Haifa. Building on this experience, he then concentrated his operations within an independent law firm that has helped hundreds of satisfied clients over the last few years.